We’d love your help. 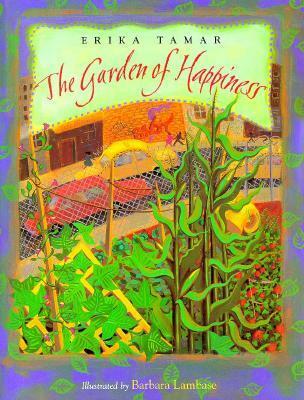 Let us know what’s wrong with this preview of The Garden of Happiness by Erika Tamar. To ask other readers questions about The Garden of Happiness, please sign up. Book cleverly encourages making world better, more beautiful and gardening all through a touching story. Cute. I love the pictures. There is a sense of community in the story which I really liked. The idea of coming together, making things grow, and bringing happiness is nice. It would work for a story time because it moves. Older kids and younger ones would like it I believe. But I can't pronounce some of the phrases of the people and would not be able to do the story justice. Perhaps a book talk on this one. Marisol, who lives on the East side of New York City, joins her neighborhood in replacing a garbage-filled lot with a garden. She only gets a small corner to plant a single seed in but her sunflower becomes the excitement of the entire neighborhood. This book represents many cultures in an indirect way and it also represents unity among a multicultural neighborhood. I love that you can feel the attitudes of each character in the book just by the things that they say. This review has been hidden because it contains spoilers. To view it, click here. This is a book about a girl who plants something in the city and the effect that has on her. As well as the sadness of the loss of the flower but the joy in remembering the growth, and celebrating it year-round. Great for a sunflower seed unit...and is multicultural. A nice story about a neighborhood garden & mural that revitalize a vacant city lot. Various ethnic groups represented, along with traditional foods from those groups. Talks about plants' growing cycles too. Overall a very nice book, if a bit too many words for my little one's attention span. This seemed a bit forced, though a story of community togetherness is always welcome. I might use it in a class in an urban area as it is a story of positivity in an urban area. Wonderful book about a girl who helps create an urban garden. Tremendous illustrations.